Ibiza Spotlight completed the ultimate closing party day and night in Playa d'en Bossa. When it comes to partying, it doesn't get more convenient than Ushuaïa and Hï ibiza. Make that the closing parties and you have got yourself the ultimate treat. We took on the opening party madness back in May and could not resist going back for another dose of that addictive medicine. It all started with ANTS in the day and was washed down with Black Coffee at night. The ultimate Saturday clubbing double-whammy, these events complement each other musically, too. ANTS gets the party going with high energy tech house while Black Coffee takes it deeper and darker once the sun disappears. The mood changes, but the energy doesn't. For those short clubbing weekends away on the island, this combination makes sense both logistically and musically. Let's hope it's back again next season. For now, read on to find out what went down at the final Ushuaïa and Hï Ibiza events of the year with ANTS and Black Coffee. Two of us from the Ibiza Spotlight clubbing team teamed up to tackle both on this ultimate closing party clubbing day. Here goes. Let's face it the Ushuaïa closing party was never going to be a small affair. True to form, the ANTS colony put on an explosive finale jam-packed with 13 mega acts celebrating the end of what's been a staple event of the Ibiza party calendar this year. Ushuaïa was the only place to be on Saturday 6 October, and with so much talent on the line-up, the doors of Ushuaïa opened early. We got a full 12 hours to maximise the game times. It was like something out of a scene from A Bugs Life. The mammoth main stage was decorated in gigantic green leaves as if to symbolise the offering and we were amongst the almighty colony of ANTS feasting upon the very best tech-house belters one final time. With complimentary ANTS fans provided upon arrival, it wasn't just the weather on this glorious October afternoon that was going to make us sweat. It may have been an early start for Camelphat and Solardo but no clubber on Ibiza was going to miss this back-to-back. The energy was buzzing from the off. The stand-out track for me would have to be Accelerator by Camelphat and Solardo themselves. These guys know how to get you excited - we can't wait for this tune to be released next week. Taking over from what was one of the most enthusiastic daytime sets to date, Butch and David Squillace rolled out more uplifting house belters keeping our feet firmly on the dance floor. The vibe was electric and it certainly was turning out to be a lovelee day. The beachside Ushuaïa constantly outdoes itself when it comes to phenomenal production and on this day we once again got the full mind-blowing lighting, visuals, incredible pyrotechnics and abundance of confetti. The whole picture was complemented further by smoke cannons surprising us at every given opportunity and more deserved woos and claps from the crowd than heard before. With epic disco tracks like Strong Enough by Junior Sanchez blasted by Luciano b2b Carl Craig, it's no wonder the guy in charge of pressing the button for the fireworks may have got a tad excited. Maybe the almighty vibrations from the speakers were to blame. Either way, it was going OFF. When Nic Fanciulli and Steve Lawler took over the decks, my Shazam went into overdrive. Endless fist-pumping house tracks played one after the other – the tempo had rocketed and the tunes were killer. As much as we didn't want this party to come to an end, the final b2b of the evening was the one which I was looking forward to the most. The soundtracks of this set couldn't have been more appropriate. We were treated to a fantastic mix of all of our favourite tracks from ANTS parties, ranging from old-school dance anthems such as Rhythm Is A Dancer to current euphoric tracks the likes of Neutron Dance that have taken the island by storm this summer. The final set had it all. Ending the night on the balcony terrace at the back of the venue made for the perfect opportunity to take it all in. What a moment. As the night rolled over curfew, the venue was still heaving and rightly so. A spectacular display of fireworks saw the party end with a bang and our adrenaline roaring. It was time to head across the road to Black Coffee. Could this night possibly get any better? The answer would be yes. 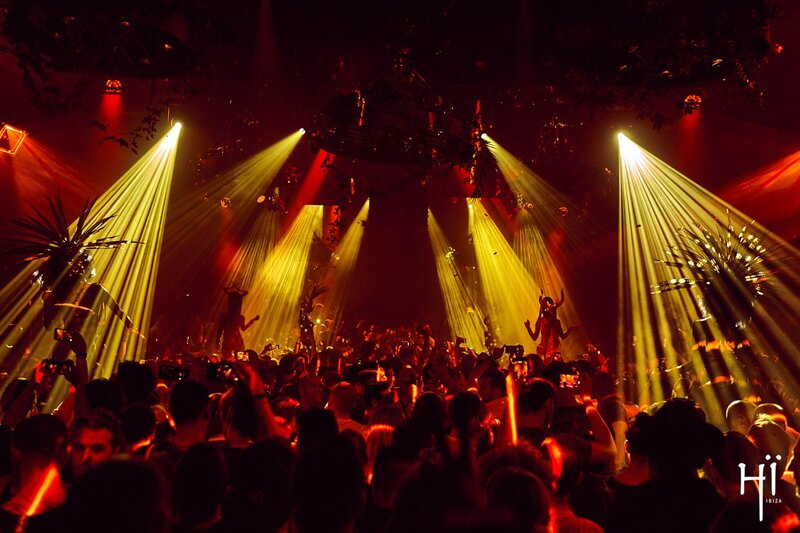 After an overwhelmingly superb joint Ants and Ushuaïa closing, it was time to watch the curtain come down on Hï Ibiza's 2018 season where Black Coffee was entrusted with the task of throwing the final party at the Playa d'en Bossa club. After an enthralling opening, he was certain to deliver. Andrea Oliva and Nic Fanciulli made the short trip across the road from Ushuaïa to play a special back-to-back performance as the club fleetly began to fill. After hearing them both at ANTS earlier - albeit during other back-to-back sets with Richy Ahmed and Steve Lawler - I was excited to see a different blend of music from these two experienced Ibiza DJs. This funky number by Milk & Sugar with Ron Carroll was a sweet opener as we stumbled through the doors and into the Theatre. Many around us had made the same short trip across the road and were more than up for it. Before embarking on this Ibiza season, I promised myself that I would leave the island having discovered many more artists whom I had not previously listened to. In the Club room, Berlin-based DJ and Bar25 resident Nico Stojan was getting started. Although Andrea and Nic were doing the business on the main dancefloor, I had to add him to the list, a list on which he now sits high up. The German selector simply stunned me with his tune selection. This drum-beat-filled banger by Laolu and Mr Raoul K perfectly enveloped the room with a distinct atmosphere from the African continent. It was an assured performance that had the Club's alternative room dancing in high spirits from start to finish. Nico Stojan left us euphoric. It was then the turn of Virgil Abloh. The acclaimed fashion designer and artistic director of luxury fashion brand Louis Vuitton has sporadically appeared at premier events across the island, including Black Coffee earlier in the summer and DC10 for Circoloco. This was my first time on the dance floor with Abloh behind the decks. I'll admit: I was more than sceptical. But if Black Coffee and Circoloco have continued to put their faith in him, then how can I question? My ignorance was apparent after hearing the first selection. Oluhle and Colle's Owami was a fine choice. Virgil Abloh announced himself. Each tune had elements of deep house titans such as Dixon, Solomun and, of course, the main man himself Black Coffee. Melodic groove was the signature of this set. One that stood out was by Dodi Palese titled Cells. I almost broke my wrist trying to get my phone out to Shazam. The whole of the Theatre was left in awe. The jury may still be out, but the judgment on this night was clear: Virgil Abloh is no stranger to music. Black Coffee entered and they embraced before taking the driving seat. I've enjoyed his residency countless times this season but was poised for one more even while sad that it would it be the last - at least for this year. Innervisions' releases are no newcomers to Black Coffee's residency, part of why I enjoy it so much. Y.O.U.D. by Culoe De Song seized the Theatre, as it has done throughout the summer. Black Coffee was focused and in his element. Hï Ibiza placed trust in him for his debut season last year. For this one, the trust has turned to treasure: Coffee has turned to gold. Personally, Saturday nights on Ibiza are synonymous with one tune. Thanks for making Saturdays special, Black Coffee. Ushuaïa and Hï Ibiza have strengthened their clubbing draw yet again this season. Playa d'en Bossa still sits at the top-end of Ibiza's super-club party destination. ANTS has now firmly established itself at Ushuaïa and Black Coffee is quickly creating that same loyalty to Hï Ibiza. The two have created a fantastic clubbing day-to-night double-header - and the ultimate closing party treat.